WEATHER AT START: 55° Partly cloudy… and windy as hell. 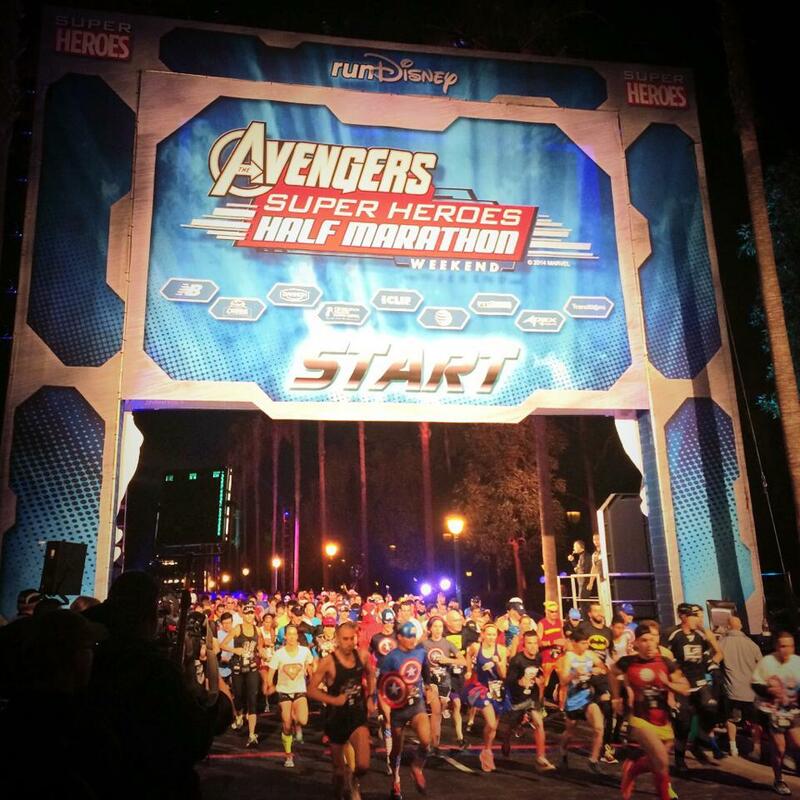 Disney has added a new race to its fall California schedule, as runners dressed up as their favorite Marvel super heroes for the inaugural running of this half marathon. The villain at this race, however, were the blustery Santa Ana winds that battered runners throughout the race. Disney races have the distinction of basically being the costliest in the land and also just about the fastest to sell out. 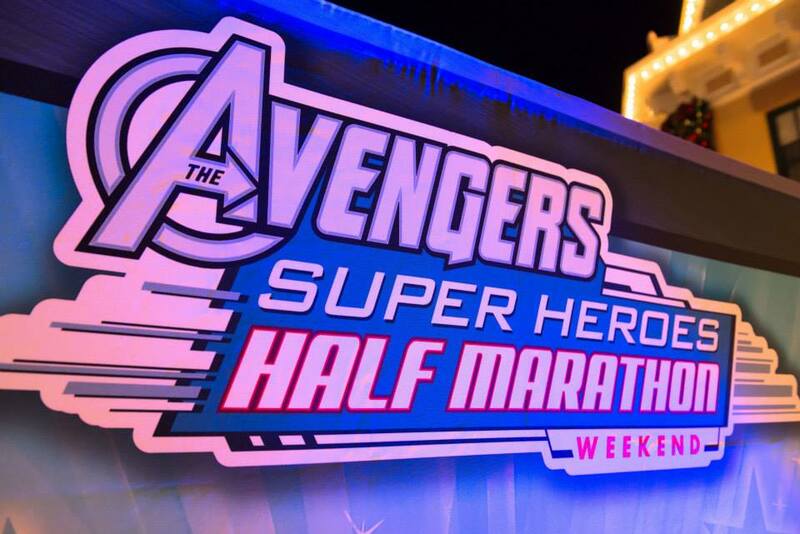 The first running of the Avengers Super Heroes Half Marathon sold out in just 110 minutes and those fortunate enough to make the roster paid $195 (plus convenience fees) for a whopping $208 price tag. That’s enough to make even Tony Stark say “Ouch.” Oh, and for the record did anyone else notice the absence of Tony Stark and his alter ego Iron Man from the race (probably some contactual or legal issue that keep this hero at home)? 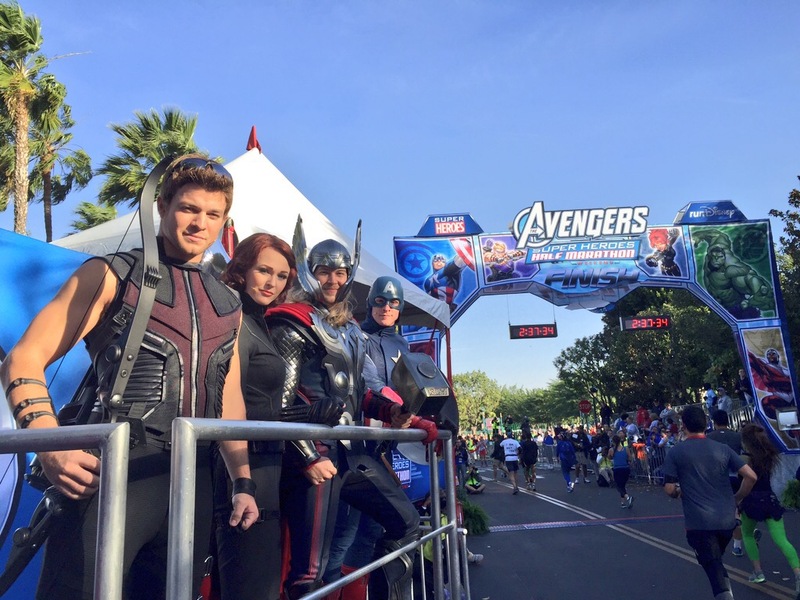 As for the expo, like its Disneyland Half Marathon counterpart, the Avengers race held its expo on Friday and Saturday at the Disneyland Hotel. I can’t speak too much about the expo because I basically missed it. Thanks to traffic I arrived just as the doors were about to close on Saturday at 4:00pm (a little early to close the day before a race if you ask me). I barely got my bib and tech shirt before I was informed that the expo was now closed. From what I heard, the expo was decent sized with a good number of vendors on hand to show you their latest wares. Parking at the Disneyland Hotel is usually $17, but the cost was waived for a half hour (according to the parking attendants). I have a feeling you could take as long as you want without being charged. One note about the expo has to do specifically with the Disney merchandise available for purchase. Like many of the Disney races, people stampede the expo early on Friday to buy as much as they can and turn around and sell it on eBay for a profit. The downside is many runners reach the expo only to find the shelves empty of the souvenirs they so desperately covet (even with inflated price tags). C’mon Disney, surely you can come up with a method that allows all of the runners to be able to purchase your goods (say perhaps online) or maybe you can stock a bunch more (it’s most likely going to sell). 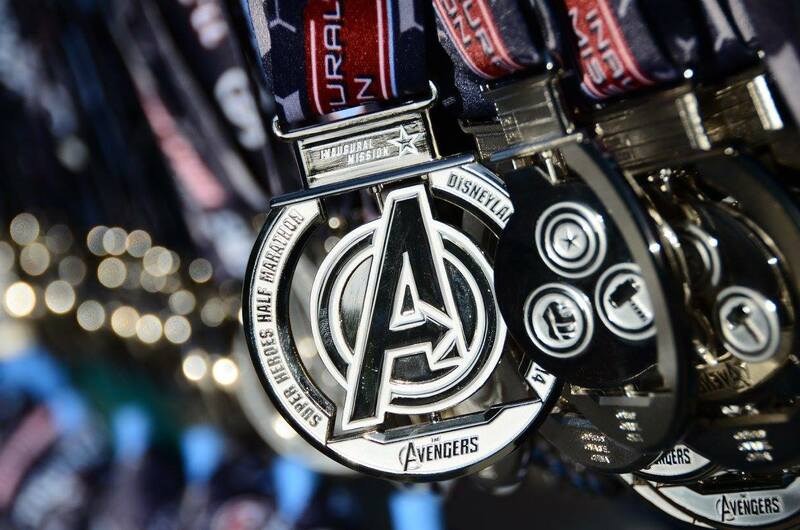 Disney prides itself on its race bling and they did a solid job on the inaugural Avengers race. The medal features a revolving Avengers (“A”) logo and a black ribbon emblazoned with the crests of the various Marvel heroes. And while the medal could have used a little more color (maybe make the “A” black or red), it is pretty sweet. The tech shirt (voted upon by participants) ended up being a straightforward black design complete with the race’s “tech style” logo on the front and race sponsors on the back. Not overly original, but crisp, clean and still pretty neat. Oh, and an added twist was the shirt was a long sleeve. I think most runners were expecting a short sleeved shirt, but again no complaints. Like other Disney races, you have a myriad of choices when it comes to parking. If you stay overnight at a hotel (like I did) expect to spend $20 on parking (one of those annoying added costs that hotels tack on to your bill… you hear me “occupancy fee”). For those of you who choose to park at the Disneyland theme park, prepare to shell out $17 (no breaks on price here). Fortunately, the city provides shuttles from many of the major hotels to the start area. And we’re running for justice. This flat “loop” course turned out to be a pleasant surprise for me. Courses around Disneyland tend to be a combination of good and bad. Good: running through California Adventure, Disneyland and Angels’ Stadium. Bad: pretty much the rest of the course. When I signed up for the race, I expected this course to be a carbon copy of the Disneyland Half Marathon route. Happily, the middle portion was a bit different. The best part of the race was still the beginning of the race when you run through California Adventure and Disneyland (done by mile 3). Inside the parks you can stop to have your picture taken with a number of costumed Avengers (and a few other Disney characters too). Once outside the park, you did again run around the streets and neighborhoods of Anaheim, but this time it seemed to be a better part (or at least slightly more scenic part) of Anaheim. At mile 8 you make your way into Angels’ Stadium where you get to run around the playing field (and can see yourself on the Jumbotron). Once outside of the stadium, you make your way back to the Disneyland Hotel and the finish line. video montages and a pair of “overly-caffeinated” hosts to get us all ready to pound the pavement. On the course, the race had a similar organized feel. Aid stations were numerous and well-manned with volunteers. Plenty of photographers from MarathonFoto were on the course and participants and their families were able to track their progress with free runner tracking. Disney did have a problem this race with its mile markers. While the signs themselves were cool (and each had a digital clock showing the elapsed time), several were blown over by the high winds (not Disney’s fault). I did notice however, that two of the markers were not at their proper spots (the mile 8 marker was almost at 8 1/2 miles… I verified this with several other runners). 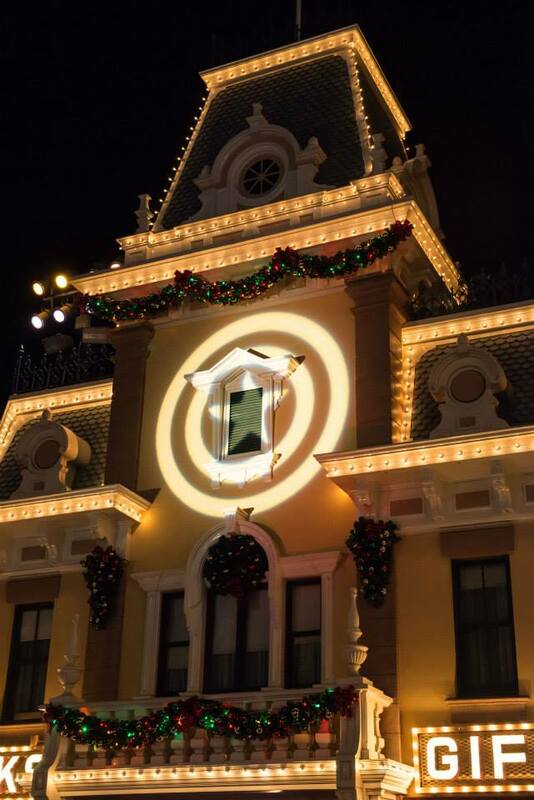 It’s unlike Disney to make this kind of mistake, perhaps it just got blown almost a half mile by the winds. The finish line was just as organized as the start area. Runners were greeted by volunteers hanging finisher’s medals around their necks and others handing out pre-packaged boxes of post-race snacks. On the upside, the Avengers Super Heroes Half Marathon is a well organized race showing off the standard Disney treatment. Running through Disneyland is fun and the swag is good. However, the race does fail to separate itself from other Disney races. It feels pretty much like every other Disney race, just with a different skin (The Avengers instead of Mickey Mouse). For the $195 price tag I was expecting something a bit more… heroic? Unless you are a diehard Disney-phile who must do every race the mouse puts out, I think you’ll suffer from a “been there, done that” vibe. 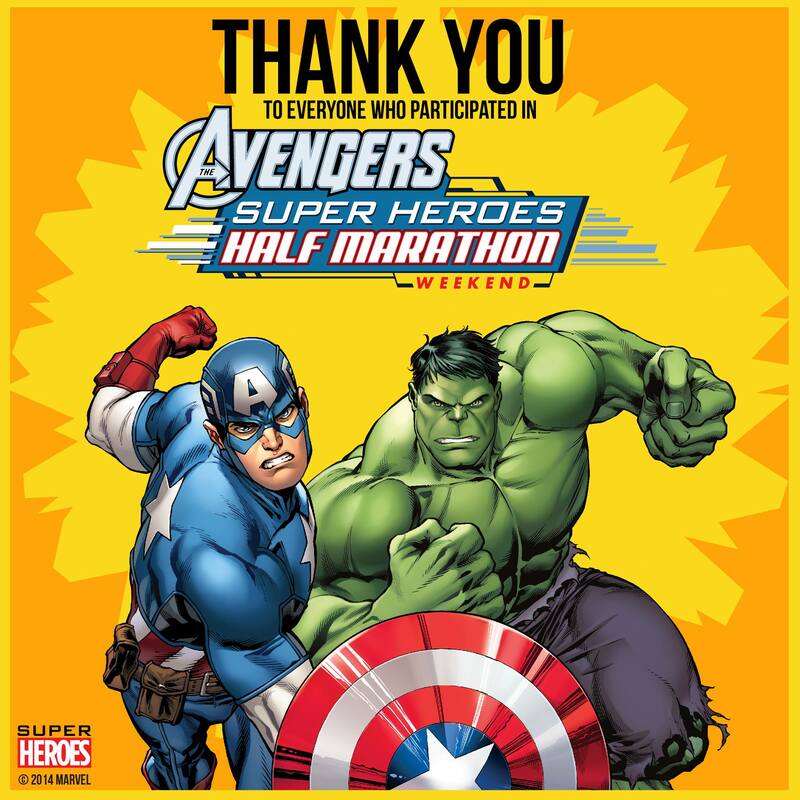 I’m worried that the Star Wars Half Marathon in January (which I’m also signed up for) will suffer from the “same-ness” that the Avengers Super-Heroes Half Marathon did. I have a feeling that if I do continue running Disney races ($195 is a big chunk of change for a single race after all), one per year (probably Star Wars) will be more than enough. 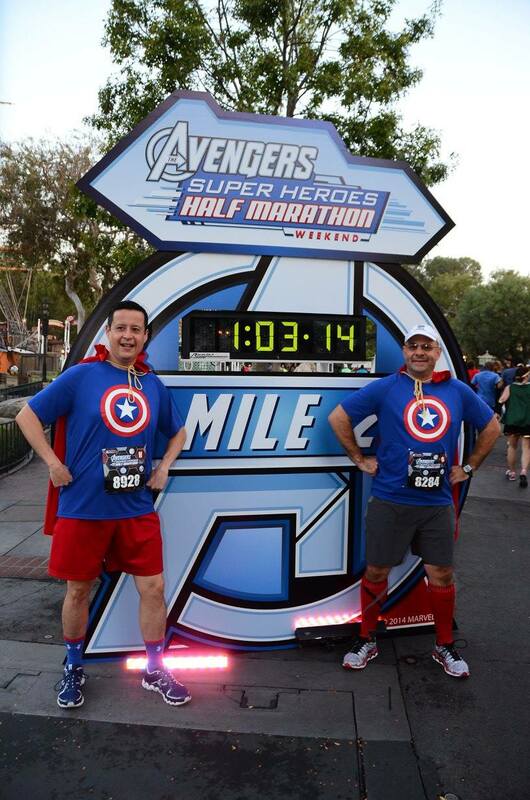 Posted on November 21, 2014, in General, Race Review and tagged Avengers Super Heroes Half Marathon. Bookmark the permalink. 2 Comments. Yeah, I’ve never run a Disney race and don’t plan too. The price is one thing, but usually not a deal breaker for me (I’ve done RnR Vegas twice, for example), but I’m just not into all the Disneymania. I picture having to dodge people taking pictures, various character stops, and it just doesn’t strike me as something I’d enjoy. I heard from several folks that the wind was brutal . . . I was worried about that in Vegas (Sunday morning was VERY cold and breezy) but it died down by race time, as you know. Anyway, on another note, has REVEL announced the date for next year’s Canyon City event? Just found out the Big Sur Half is on November 8, so if CC is the same weekend as this year, I might be able to swing both. Disney is an odd beast. While the organizational aspect is kinda nice (they do know how to organize things), it can feel a little “too corporate.” And the people stopping for photos can be a bit much (lots of dodging). The wind was pretty harsh at times, but at least it wasn’t cold. Haven’t heard the date yet for Canyon City 2015… it shouldn’t be too long before they announce it. And they’ll probably also have a good deal for people who sign up right away (I’ll be sure to post it when it’s up).